The All-Go lightweight electric bike has a frame made with carbon fiber. US-based M2S Bikes has set up a Kickstarter to fund the development of the All-Go lightweight electric bike made with carbon fiber. According to the company, the electric bikes currently on the market can be very heavy, which makes loading them onto a bike rack or pedaling them home harder. 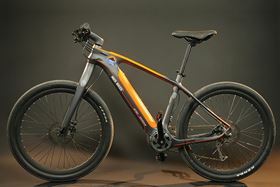 However, the All-Go Bike is reportedly more versatile and lightweight, weighing 33 pounds including the battery. It can reach speeds of up to 28 mph with a motor that can deliver over 600 watts of peak power. Go here to visit the Kickstarter page. This story is reprinted from material from M2S Bikes, with editorial changes made by Materials Today. The views expressed in this article do not necessarily represent those of Elsevier. Hexcel Corporation has partnered with a 3D printing company to produce what it says is the world’s first 3D-printed commuter bike.